Audit Engagement Letter is the letter which is sent by the auditor to his client (Business) for avoiding any misunderstanding in collection with the conduct of audit. Before the starting of audit of a business the auditor sent a letter to management for avoiding any misunderstanding in collection with the conduct of Audit this letter is known as “Audit Engagement Letter”. 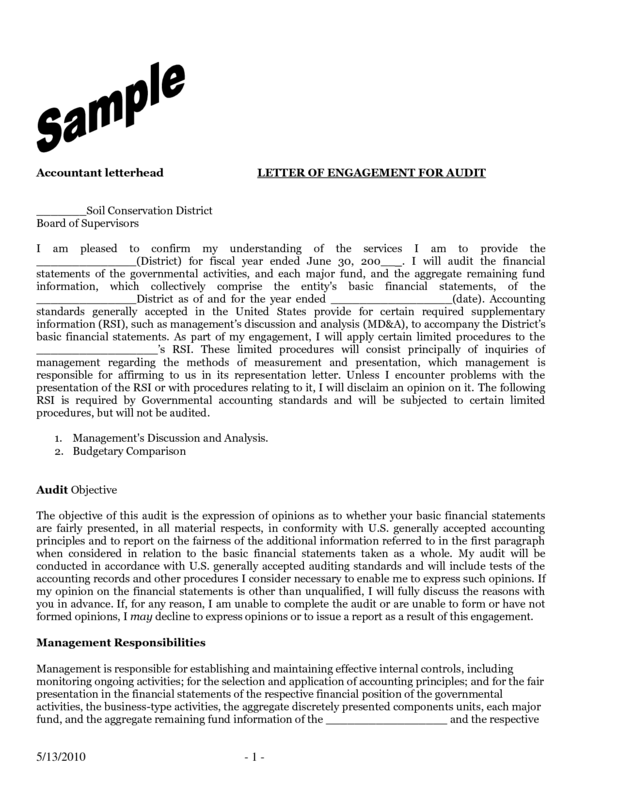 The nature of Audit Engagement Letter may vary from business to business client to client. The first point of Audit Engagement Letter stated in ISA-2 is Objective of the Audit.The auditor must inquire from the management about the objective of the audit of financial statement of the business. The 2nd point of Audit Engagement Letter stated in ISA-2 is Scope of the Audit.The auditor asks through the audit engagement letter from the management about the scope of work in detailed for performing his audit work. The auditor should know him management responsibilities for the final information which will be required by him by the course of audit he should know the extent of the obligation of the concern paper for fixing the responsibility. The auditor also needs the confirmation of the audit engagement for the current year. The auditor must obtain the list of the concerned management staff responsibilities for keeping and mentioning the accounting records. So the responsibilities in case deduction of error and irregularities in the accounting records may be easily find. The auditor usually obtains for management the limit of access to the records comments and other info related to the audit process. The auditor should inquire about the attaining regarding the . The auditor places the request in the letter to the management for the drawn by acknowledging the receipt of engagement letter the management is bound to do so otherwise the audit wall not be helped responsible for the same. The auditor inquires about the nodes and basis on which fee are computed the procedure and arrangement of other bulling related to the audit work during the process of conduct of audit. If in some cases technical advice is required and expert are involved the surety of their management and procedure or who will manage the same. If the internal auditor or other staff is needed by the auditor, their arrangement and procedure of their availability. The last point of Audit Engagement Letter is legal requirement. Any other legal requirement in connection with audit or any legal provision which may affect the work of audit. 3 Methods of Winding up of a Company? Salman Qureshi is Researcher & passionate Blogger, he loves to write on Commerce & Management Sciences subjects to assist students, Hope you guys will like his effort.